CHICAGO--(BUSINESS WIRE)-- Hyatt Hotels Corporation (NYSE: H), PRISA Group and McConnell Valdés Consulting today announced the groundbreaking for Puerto Rico’s fourth Hyatt-branded select service hotel, the $29.7 million Hyatt Place San Juan. The announcement comes on the heels of the recent opening of the 126-room Hyatt House San Juan, which opened October 1, 2014, and confirms Hyatt’s commitment to Puerto Rico and the region. Hyatt Place San Juan will be developed by a joint venture between affiliates of Hyatt, PRISA Group and McConnell Valdés Consulting, Inc. As part of the transaction, a Hyatt affiliate has entered into a management and related agreements with the joint venture for the operation of the hotel. 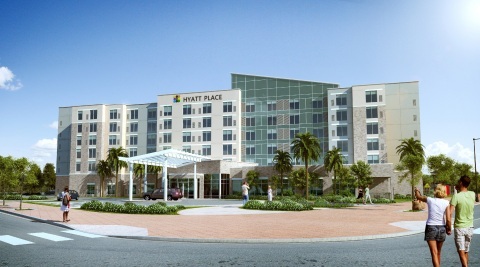 Hyatt Place San Juan is expected to open in the first quarter of 2016. The 149-room Hyatt Place San Juan will be located in the Puerto Rico Convention District in San Juan, adjacent to the recently opened Hyatt House San Juan. The Puerto Rico Convention District is a master planned project comprising of 113-acres, which currently includes the 600,000-sq.ft. Puerto Rico Convention Center, the largest and most technologically advanced facility of its kind in the region. Building on strong gains in Puerto Rico’s tourism activity, the Puerto Rico Convention District is currently seeing a surge of development activity and is in the process of unveiling several major projects. Hyatt Place San Juan will be centrally located and minutes from all major attractions and beaches in the Old San Juan, Condado, Miramar and Hato Rey districts. It will also offer easy access to all major cruise ship terminals and Puerto Rico’s International Airport. In the past 11 months, hotel owners and developers PRISA Group and McConnell Valdés Consulting, Inc. have seen three Hyatt-branded select service hotels open in Puerto Rico, representing over $115 million in development costs for them. The 156-room Hyatt Place San Juan/Bayamon opened in December 2013, the 106-room Hyatt Place Manatí opened in March 2014 and the 126-room Hyatt House San Juan opened in October 2014. Hyatt Place, a brand of Hyatt Hotels Corporation, offers more than 200 locations in the United States, Armenia, China, Costa Rica, India, Mexico, Puerto Rico, Chile, the Netherlands, and United Arab Emirates. For Hyatt Place information or to make a reservation, call 1-888-HYATT-HP (888-492-8847) or visit www.HyattPlace.com. PRISA Group (PRISA) is a family-owned developer and builder of green residential communities and resort hospitality projects in Puerto Rico and Florida with over 6,000 units in planning and construction, representing a value of over $3 billion. The firm has delivered over 3,000 units in the last 20 years and is currently developing projects in Dorado, Vega Alta, Gurabo, San Lorenzo, and Humacao, Puerto Rico, as well as in Tampa, Florida. PRISA Group has received numerous awards, including Builder Member of the Decade and three Master Planned Community of the Year Awards by the National Association of Home Builders’ Puerto Rico Chapter, as well as the highest honor bestowed upon Puerto Rico developer, the Frank Ramirez de Arellano Award. PRISA Group is currently developing the Dorado Beach Resort, a $1.4 billion development, including the Dorado Beach, A Ritz Carlton Reserve, the first in the Americas, which opened to the public in December 2012, and the J.W. Marriott Dorado Beach, currently in development. In addition, the Company developed and owns two Hyatt Place & Casino projects in Bayamon and Manati, Puerto Rico, which opened in December 2013 and March 2014 and the Hyatt House San Juan, Puerto Rico’s first Extended Stay hotel, which opened in October 2014. For more information, please visit www.prisagroup.com.